Add another item to the Northern Illinois volleyball team’s list of achievements this season as the Huskies took down Western Michigan for the first time since 2006 on Thursday night at Victor E. Court in a critical early season Mid-American Conference match, 22-25, 25-17, 25-27, 25-21, 15-10. All the odds seem stacked up against NIU (16-2, 2-1 MAC) entering the match. The Huskies hadn’t beaten the Broncos (11-5, 2-1 MAC) since Sept. 28, 2006 — almost four years to the day. In that span, WMU had won seven matches in a row over NIU. 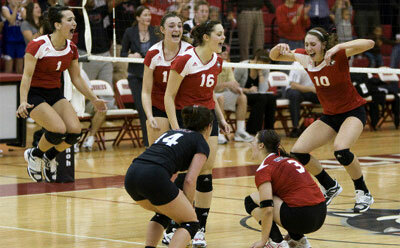 The three-time MAC West Division defending champions also came to DeKalb on a five-match winning streak. However, the Huskies were due to break through, and they did just that by out-scoring Western 87-71 with the help of a .298 attack percentage, compared to the Broncos’ .228. A factor of both the past and present has been NIU’s home court advantage as the Huskies continued their dominance at Victor E. Court. In ending their season-long home stand with an exclamation point, the Huskies improved to 5-2 during the stretch and 10-2 at home this year. NIU also improved to 38-30 at “The Dog House” against conference foes and 85-50 overall under Gooden. Needing five sets to decide the winner, the match showed why both teams are near the top of the league as there were 10 lead changes and 24 ties. NIU got off to a slow start in the first set, falling down 11-7 and needing a timeout to regroup, but WMU stayed strong to keep the cushion for the win. The Huskies found their groove in the second set, though, hitting .500 with 15 kills. NIU opened a 14-6 lead with the help of three kills by freshman outside hitter Lauren Wicinski (Geneva, Ill./Geneva) and two from sophomore middle blocker Mary Kurisch (LaCrosse, Wis./West Salem). NIU then rode the run to an easy win to knot the match. The third stanza started out much the same as the second, as NIU continued to roll. However, with the Huskies up 15-8, Western Michigan clawed back to tie it at 22-22, forcing an NIU timeout. But the Huskies could not slow down the Broncos, who would go on to regain the match lead with the help of four Huskie errors down the stretch. With the match on the line in the fourth set, the teams battled back and forth to the tune of 18 ties and nine lead changes. The last tie came at 20-20 after a WMU serve error out of an NIU timeout. Sophomore outside hitter Meghan Romo (Valparaiso, Ind./Valparaiso) then started a 5-1 run with a kill and would add another during the spurt to help force a fifth set. “I was proud of our ability to fight back and win a really tough fourth set,” said Gooden. In the match-deciding set, NIU took an 8-7 lead at the turn following a kill from freshman middle blocker Sarah Angelos (Waukegan, Ill./Waukegan). The teams then exchanged points on errors before a WMU kill tied the score, 9-9. Then the nation’s 10th leading kills getter took over. Wicinski blasted down three straight balls to put NIU comfortably ahead in ending the match on a 5-1 run. “We had a great battle in the fifth, where we went up 8-7 at the switch, and were able to capitalize on a couple runs to close out the match,” Gooden said. Wicinski, the country’s freshmen leader in kills and aces, notched a season-high 29 kills on the night with a .309 attack percentage and 12 digs for her ninth double-double. She also added three blocks and an ace to give her a team-high 32.5 points, which she has achieved in two of her last three matches. Junior outside hitter Allison McGlaughlin (Morton, Ill./Morton) and junior setter Kristin Hoffman (Batavia, Ill./Batavia) also registered double-doubles. Hoffman tied a season high with 67 assists and had 10 digs for her third double-double, along with three kills and two blocks. McGlaughlin tied a season high with 15 kills and had 12 digs, adding three aces to boot, in her third double dip of the year. The sophomore combo of Kurisch and Romo provided stellar production as well. Kurisch turned in 12 kills and a .379 hitting percentage with one ace. Romo totaled 11 kills and a .348 hitting percentage along with a block. In the back row, a pair of defenders had exception performances. Senior libero Maddie Hughes (St. Charles, Ill./North) piled up a season-high 27 digs, while freshman defensive specialist Justine Schepler (Sycamore, Ill./Sycamore) had a season-best 13 digs. Next up for the Huskies is a three-match road trip. The first away contest of the conference season is at 1:30 p.m. Sunday, Oct. 3 in Oxford, Ohio as NIU takes on the Miami (Ohio) RedHawks (6-10, 1-2 MAC). NIU is 2-0 on the road and 1-0 on Sundays this season.